“For the first time clinicians can accurately sample a wound in situ to determine if bacteria are present as well as more effectively debride a wound under fluorescence visualisation. These are fundamental areas of everyday wound care that have remained suboptimal for too long, until now,” says Dr. Ralph DaCosta, Founder, Chief Scientific Officer and Director, MolecuLight Inc.
An estimated two million people are living with a chronic wound across Europe and an estimated 16% of all chronic wounds remain unresolved after a year or longer.9,10,11 Ensuring wounds are appropriately diagnosed and treated is a priority for healthcare providers across Europe, reducing cost and improving outcomes for patients. 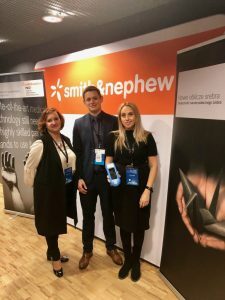 Smith & Nephew is a global medical technology business dedicated to helping healthcare professionals improve people’s lives. With leadership positions in Orthopaedic Reconstruction, Advanced Wound Management, Sports Medicine and Trauma & Extremities, Smith & Nephew has more than 15,000 employees and a presence in more than 100 countries. Annual sales in 2016 were almost $4.7 billion. Smith & Nephew is a member of the FTSE100 (LSE:SN, NYSE:SNN). 1. DaCosta RS et al. Point-of-care autofluorescence imaging for real-time sampling and treatment guidance of bioburden in chronic wounds: first-in-human results. PLoS One. 2015 Mar 19;10(3). 2. MolecuLight Inc. PN 1189 MolecuLight i:X User Manual. 2016. 3. MolecuLight Inc. Case Study 0051 Track Wound Size and Bacterial Presence with the MolecuLight i:X 2016. 4. Hoeflok J et al.. Pilot clinical evaluation of surgical site infections with a novel handheld fluorescence imaging device. Proceedings of the Annual Military Health System Research Symposium (MHSRS); 2014 Aug 18- 21; Fort Lauderdale, FL. 5. Raizman R. Point-of-care fluorescence imaging device guides care and patient education in obese patients with surgical site infections. Presented at: CAWC 2016. Proceedings of the Annual Canadian Association of Wound Care Conference (CAWC); 2016 Nov 3-6, Niagara Falls, ON. 6. Raizman R. Fluorescence imaging positively predicts bacterial presence and guides wound cleaning and patient education in a series of pilonidal sinus patients. Proceedings of the Annual Wounds UK Conference; 2016 Nov 14-16; Harrogate, UK. 7. Ottolino-Perry K et al. Improved detection of wound bacteria using fluorescence image guided wound sampling in diabetic foot ulcers. Int Wound J. 2017 Feb 28. doi: 10.1111/iwj.12717. 8. Posnett J et al. J. Wound Care (April 2009), The Resource Impact of Wounds on Health-care Providers in Europe, vol.18 (4). 9. Lindholm C and Searle R. Wound management for the 21st century: combining effectiveness and efficiency. Int Wound J. 2016 Jul;13 Suppl 2:5-15. 10. Siddiqui AR and Bernstein JM. Chronic wound infection: facts and controversies. Clin Dermatol. 2010;28:519–26. * Rosemary Hill is a paid consultant of Smith & Nephew or MolecuLight Inc.